Reports say sometime in November, Robert Mueller's team interviewed the president's son-in-law and adviser as part of the team's Russia investigation. Jared Kushner reportedly met with special counsel Robert Mueller's team at some point in November. 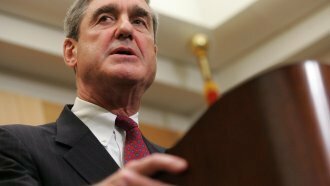 Mueller is leading an investigation into Russian interference in the 2016 U.S. presidential election. Sources told CNN that Mueller's team spent the majority of the meeting asking Kushner questions about former national security adviser Michael Flynn. Flynn resigned in February after he misled Vice President Mike Pence about communications he had with Russia's ambassador to the U.S. before President Donald Trump took office. Flynn appears to be a key part of Mueller's investigation. The New York Times reports Mueller's team questioned Kushner about a December 2016 meeting between him, Flynn and Russian ambassador Sergey Kislyak. It's unknown how much of Mueller's investigation — if any — is centering on Kushner. But he's already been somewhat of a focus in other Russia investigations taking place on Capitol Hill. He's spoken with both the Senate and House intelligence committees, and he turned over documents from the campaign and the transition to the Senate Judiciary Committee. Kushner reportedly handed over similar documents to Mueller's team. Mueller's office did not comment to media on the meeting. Kushner's lawyer said in a statement that his client "has voluntarily cooperated with all relevant inquiries and will continue to do so."